Walls Talk - What Do Your Walls Say About You? The art on your walls is a reflection of who you are. The frames are the finishing touch to 'dress' and preserve your collection. Your walls are a reflection of who you are, how you live, and the spirit that characterizes your personal and professional life. Fine framing should accentuate your art, never overwhelm it. The focal point is one of the most important aspects of a well designed room. Using a large art piece as a focal point can bring unity, harmony and balance to a space that may otherwise seem chaotic. Over the mantle or on the main wall, big art makes a high impact statement about your personal style. Using framed art or a mirror in place of a window helps to create a feeling of greater space and more light. Choose art that takes the eye further than the room itself, such as a landscape that features a horizon. Warm tones and simple, expansive imagery are perfect for adding an atmosphere of spaciousness. If you have a room with a low ceiling, hang art with a vertical or portrait-style format to help direct the eye upwards. Art featuring subjects such as trees, tall buildings, or other strong vertical elements also creates an illusion of height. We are a full service conservation framing and fine art gallery. Creativity, Selection, Quality, and Service set us apart. We are masters of our profession, artists and craftsmen with an eye to perfection and a unique sense of the need for creativity in everything we frame. We provide the service that you deserve, with attention to every detail so that the final product reflects you. As it says on our business card, our reputation hangs on your walls. We currently have framing hanging on collector's walls in thirty-four states. Choosing the right frame for your artwork is very important and can be a difficult decision. Our attention to aesthetic detail allows us to assist you in finding the appropriate frame for your artwork. The correct glass to use when framing works on paper – the importance of knowing the difference between Plexiglass, UV coated and museum quality glasses, etc. The best way to care for your new frame – cleaning products can often remove gold leaf or finishes from frames. Matting your artwork to add depth or texture to your piece, the differences between matting techniques such as over matting and float mounting. Archival framing – the different types of papers, pastes, and pressure-sensitive tapes that can be used to preserve the integrity of artwork. Taking environmental issues into consideration – direct sunlight, humidity, heat, etc. The proper backing for your work of art – only archival materials, such as acid-free foam board should be used to back artwork, so that mold and condensation are avoided. Our varied and top quality frame samples equal the eclectic blend of artwork we offer. 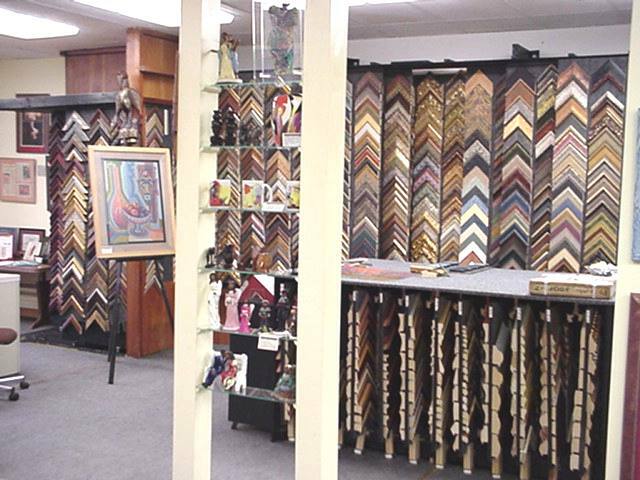 Just Lookin' has the area's largest selection of frame samples - over 4,000 framing choices from hand-finished Italian colorations to decorative filigreed golds; mottled colored woods, high tech metals, conservative classy fine furniture finished woods, sleek contemporary blacks. We have it all from the most simple to the most ornate; for every taste, budget and every décor. Just Lookin' Gallery uses only the best archival materials available in today's market. All mats and backings are 100% acid free and are guaranteed to preserve your artwork for decades to come. Conservation framing means what ever we do is totally reversible. A work of art must remain in its original state in order for it to retain its value (both intrinsic and monetary). In conservation framing, we never trim or fold a piece of art, nor do we use glue to adhere the piece to the substrate (backing board). Artwork is carefully mounted with Japanese hinges which are water soluble and totally reversible. This hinging technique allows the artwork to hang from the top to prevent damage to the piece that might occur with changes in environment, such as humidity and heat, since artwork may expand and contract at different rates than does the backing. Even if the picture should fall off the wall it would incur less damage since the hinge would tear before the artwork. There are other mounting techniques we might employ depending on the age, weight, depth and medium in which it was created. We may choose to "build" a special mounting device such as protective mounting corners to mount the piece so that nothing comes in contact with the artwork and it is "floated" on the backing board. Conservation framing actively protects against environmental factors which could degrade the object being framed. The materials used in conservation framing are made to withstand the test of time, and to protect the artwork they encase. We carry only conservation quality mat boards because they ensure clarity of color, won't fade and will never harm the art they are bordering. Many frame shops tout "acid free" mat boards as protective but truly are not. In "acid-free" mat boards, the wood pulp has been neutralized with a chemical process and will eventually return and cause damage to the art with acid burn and yellowing on the beveled edge of the mat. Only 100% cotton rag board ensures that artwork is truly protected. Alpharag Artcare technology which actually extends te life of art by slowing paper degradation, neutralizing acid by products and protecting against damaging pollutants. These museum boards are 100% cotton, fade and bleed resistant, totally acid and lignin free and buffered to maintain alkaline pH. Let us help you select mats to enhance and protect your art so it can be enjoyed for years to come. In conservation framing, there is always at least 1/8" between the artwork and the glass. Changes in heat and humidity cause paper to expand or contract, so keeping it away from the glass prevents adhesion between the artwork and the glass. Air space inside a piece that has been conservation framed minimizes the condensation of moisture which can cause mildew to grow, a problem that can occur with regular framing. Discussing where the picture will hang in terms of the light it will have reflected against it, also determines what kind of glass would be best to show it off. We have samples of all kinds of glass we can place on your artwork before you decide what you like and what makes the artwork come out the best. Not only does a mat have the practical function of holding your artwork away from the glass, it also serves a beautiful decorative function. For an extra special look we offer you separated mats, mats with fillets, floated artwork & stacked frames to create a unique signature style! We can provide you with special framing for 3 dimensional objects – jerseys, sporting equipment, medals, memorabilia and musical equipment. No matter what kind of needlework, odds are that many hours have gone into the creation of the piece. ensure that your unique piece of needle art will be properly and beautifully displayed. We stitch-mount your needle art (with a process called lacing) so that there are no puckers or wrinkles. This mounting process also ensures your needle art will remain the same as the day you brought it in to be framed so that your children and your children's children can enjoy it for years to come. We frame needle art in many ways... with or without glass, with or without mats but always with longevity of your "work of love" at the forefront. When you select glass, we recommend the highest quality of conservation glass that will keep out harmful UV rays that could cause your thread colors to fade. Using conservation glass also ensures that no moisture, dust, smoke, bugs or other pollutants will come in contact with your needle work so that your piece can be enjoyed for generations. Most people don't think of a custom framer when they think of mirrors, but they should. Off-the-shelf mirrors have a limited range of styles and sizes. It can be hard to find the perfect one. We offer many framing choices including decorative golds,mottled colored woods, high tech metals, classy fine furniture finishes and sleek contemporary blacks. We have it all from the most simple to the most ornate, for every taste and every décor. You also can get your mirror made to any size. If you have an odd space you need filled, we can custom-fit your mirror. We also carry standard size beveled mirrors and can custom make a 1 1/2" beveled mirror any size, square or rectangular. Memory (Shadow) boxes are a great way to protect and display your important treasures. A shadow box can be built to any size, to house any kind of item. From something as small as a coin to large jerseys, flags or quilts, a shadow box will keep your item preserved and safe from dust and other air bourne pollutants. Be creative! A shadow box dosen't have to hold just one object. Display a coin collection or a group of antique buttons. Try combining objects and photos to tell a story! We can help you design a shadow box/scrapbook. Not only does our gallery provide a pleasant shopping experience, it also houses our framing facility. We believe in the quality of our work, which is why we do it ourselves, on-site. We don't send out your order to be filled by someone else. We believe that each piece we frame deserves our individual attention.